Samari Curtis (15) puts up a jump shot in the first half of Tuesday’s Feb. 6 boys high school basketball game against visiting Bellefontaine. Curtis set the Xenia school record for most points in a single game with 52 in a 90-55 Buccaneers win. Xenia’s Jate Bradley and Noah Crawford double-team Bellefontaine’s Jack Clement in the first half of a boys high school basketball game at Xenia High School. Xenia’s Johnzel Gray hits a free throw in the first half of Tuesday’s boys high school basketball game with visiting Bellefontaine. XENIA — A Bellefontaine fan was doing her very best to razz Xenia senior Samari Curtis, as she watched him score again and again against her Chieftains. Finally, a Xenia student had heard enough. “Lady, he’s scored more points than your whole team!” he said. At the time, it was true. 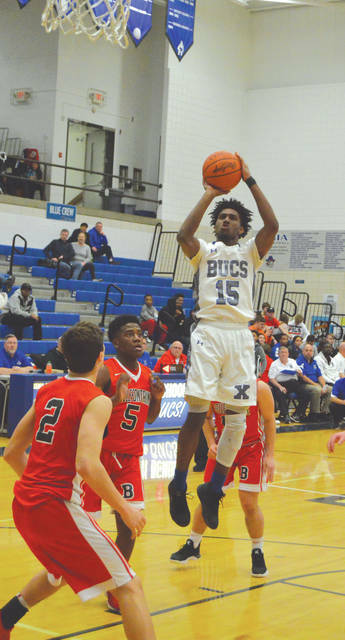 Curtis seemingly couldn’t miss, as he set the Xenia High School single-game record with 52 points scored in a 90-55 win over Bellefontaine, Tuesday Feb. 5 in Xenia’s Blue Pit. Officially, Curtis hit seven 3-pointers, scored 26 points from inside the arc, and was 5-for-9 from the free-throw line. The lanky Buccaneers senior almost seemed embarrassed to have played the first couple minutes of the fourth quarter in order to get the record. But with 5:12 left in the game, Curtis took a steal from Alex Sparks and scored a lay-up from the left side to set the record. He quickly fouled the inbounding Chieftain in order to get pulled from the game. “I wasn’t really worried about it, but my teammates? They wanted me to get it. They knew I had 50 last year (in a loss at Tippecanoe) to tie the record, and they wanted me to get it. So I just went for it,” Curtis said. “It means a lot to me (setting the record). A lot of people have supported me, and it’s good to see that the hard work paid off. Curtis breaks the record he previously shared with Robert Siwo, who according to Xenia coach Kent Anderson, first set the 50-point record during the 2000-01 season. 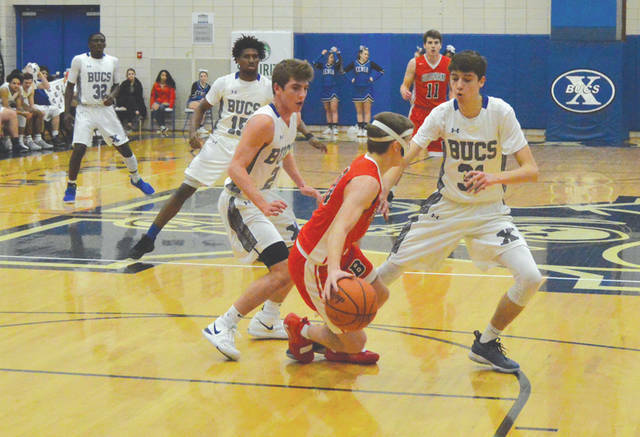 Anderson said last week’s disappointing road loss at Fairmont, plus the opportunity to post an impressive win before the Division I boys post-season tournament draw on Sunday (Feb. 10), served as motivating factors for the Buccaneers (11-8). “I don’t think we were very physical at Fairmont (an 80-68 loss), and I don’t think we were ready to play. So we came out ready to play tonight,” Anderson said. “We’ll obviously have to do the same when we play against Trotwood on Friday night. Jate Bradley was the other Buccaneer to finish in double-figures in scoring. He scored 14, Noah Crawford scored nine, Isaiah Hoyt and Johnzel Gray scored five points each, Daviohn Boccara scored three and Zack Gaither added two in the historic win. For Bellefontaine, Jack Clement led the Chieftains (4-14) with 24 points. Coach Jason Calton wasn’t upset that Curtis was gunning for the record, despite the score. 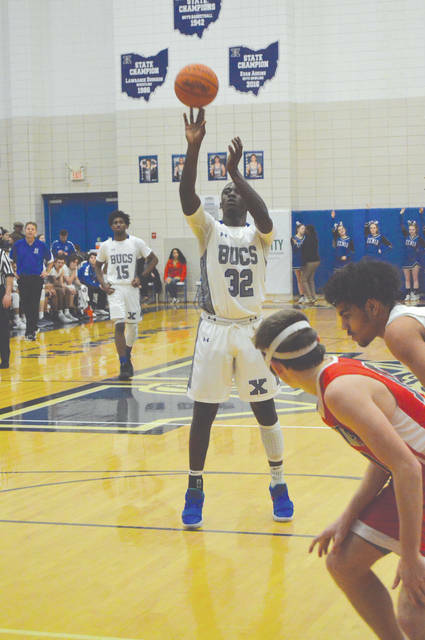 Xenia returns to action on Friday, Feb. 8 when they’ll host Greater Western Ohio Conference South division leaders Trotwood-Madison for a 7:30 p.m. game. Bellefontaine gets back into Central Buckeye Conference play on Friday, at home against Springfield Shawnee.